Early last week there was a lot of chatter on the news about the weather forecast for Wednesday evening, March 25. For some reason I just assumed it wouldn’t amount to anything, despite the obvious hints of “large winds”…”hail”…and oohhhhh I don’t know…living in tornado alley! Well, it happened. I experienced my first tornado threat here in Oklahoma. That Wednesday afternoon at work, many of us emerged from our desks to look out the window as the heavy rain turned into an unapologetic hail storm, but then oddly dissolved into rays of sunshine right around 5:00 p.m. But not for long. As I drove home it took everything in me to keep my eyes on the road and off of the eerie green sky, accompanied by a mysterious dark cloud hovering over my beloved city of Tulsa. As the hour grew, so did the seriousness in the voices of newscasters relaying the weather over the radio. Minutes later, a tornado was reportedly confirmed on-ground just a few miles west of Tulsa in Sand Springs, OK and was headed North. AHHHHHH! My heart was pounding. As I sat stuck in traffic on the main road headed into Owasso (my town, just North of Tulsa) I tried not to freak out…and I think I started humming, or something. I called Sean who was busy at work and totally unaware of the tornado threat. He was about an hour out of town, but safe and sound. Weatherman: We’ve got Jim in downtown Tulsa, so let’s go to Jim and get a check of the scene. Jim? ….. JIM!!?!? ….JIM!! !…………okay……….we’ve lost contact with Jim. The storm has taken a very heavy camera so we don’t have a visual. TAKE COVER EVERYONE! Turn off the tv and take cover. Annnnnnd right as he said that….my power went out. The hail outside got louder, and the winds picked up. I heard a siren go off throughout Owasso. My heart was RACING, y’all! I decided to clear out the closet underneath our stairs, get my comforter, pour a glass of wine (pino grigio was the tornado drink of choice…if you were wondering) and coax Stella into snuggling with me and my white wine in the closet. Sean called and that sweet hubby stayed on the phone with me for nearly an hour as he also took cover West of Tulsa. Sweet friends and family, so many of you sent texts to see if we were okay as the storm made national news. Thank you for reaching out!!! Luckily the tornado never actually made it to Owasso, and much of Tulsa was left safe. 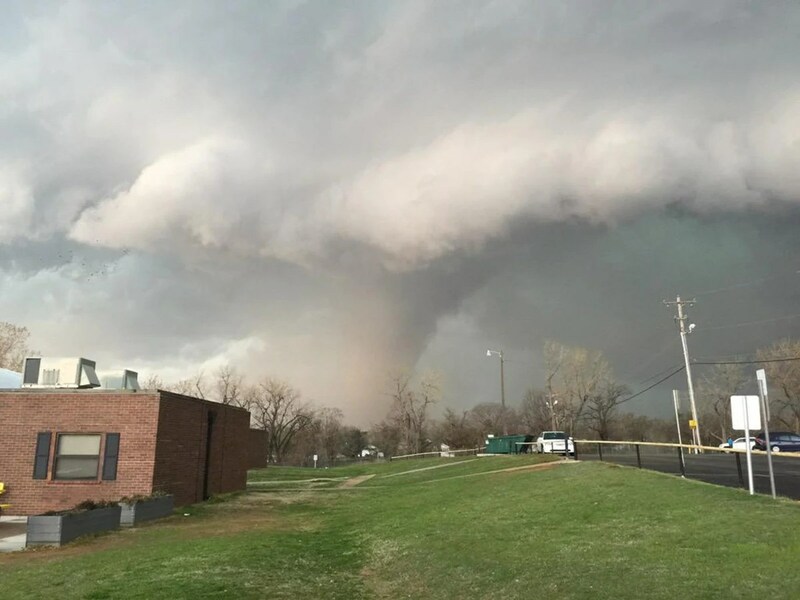 Sand Springs, however, was hit the hardest in Tulsa County (see the image below shared from NBC News). Other surrounding towns within Tulsa county were as well. In fact, nearly 200 homes and businesses were reportedly damaged and 60 homes destroyed. I can’t even imagine having our home and keepsakes gone in an instant like that. The next day, like most days here in Oklahoma, we had breathtakingly beautiful weather. I’ve fallen in love with the skies here; the white puffy clouds, the sunrises and sunsets, and the ability to see the heartland for miles and miles. It’s a beautiful place to live, filled with some of the sweetest people I’ve ever met. I have no doubt that we’ll have another scare like this eventually, but it’s good to know that we have a strong, supportive, and extraordinary community who love it here as well, and would do anything to help rebuild their hometowns. Tonight, other areas of the heartland are due for severe storms and possible tornadoes. Please say a prayer for “tornado season” throughout the heartland.